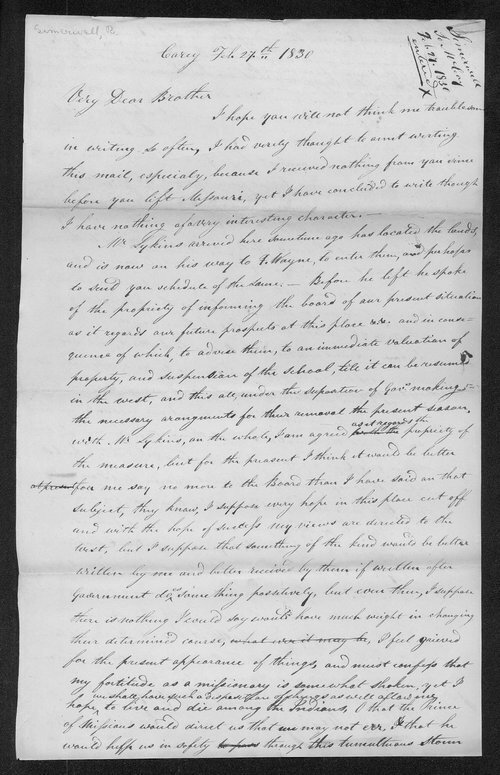 In this letter to Reverend Isaac McCoy, Robert Simerwell addresses the upcoming removal of the Native Indians living in the vicinity of the Carey Mission, Michigan Territory. Simerwell explains his stance on the issue by stating that "on the whole, I am agreed as it regards the propriety of the measure." However, Simerwell hints that he is not entirely happy with the plan to remove the Native Indians, and that it had shaken his "fortitude as a missionary." In addition, Simerwell tells McCoy about the issues facing the missionaries at the Thomas Mission, as well as the debate between the local Native Indians regarding the possibility of leaving their lands.